I never quite accepted the concept of two sets of gear shift levers - front and rear. 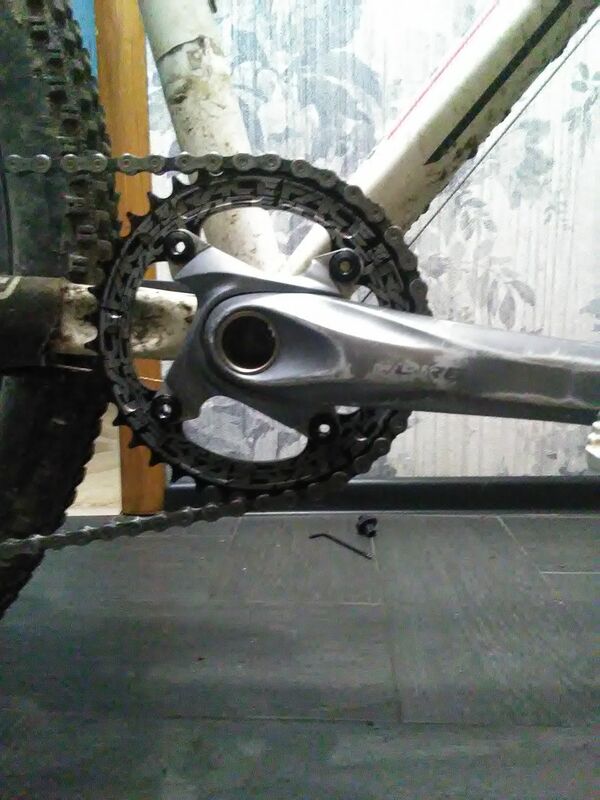 The drivetrain gear ratio is a single number - why does it have two tunables? Why do I have to keep in mind the multiplication of two numbers? Why should there be “forbidden” combinations of front/rear cogs? Finally, why do I need to carry a triple chainring with a granny gear which I only use three times a year? Most of the time, it turns out to be a bad idea anyway. I do understand technical limitations and requirements to provide huge gear ratio variation. But the concept as a whole and its details never appealed to me. Besides, being a single-speed bike owner, I do not feel like there is need for an over-engineered system to make my life “easier”. When even a single gear ratio is enough, three-by-ten gear ratios sound insane. 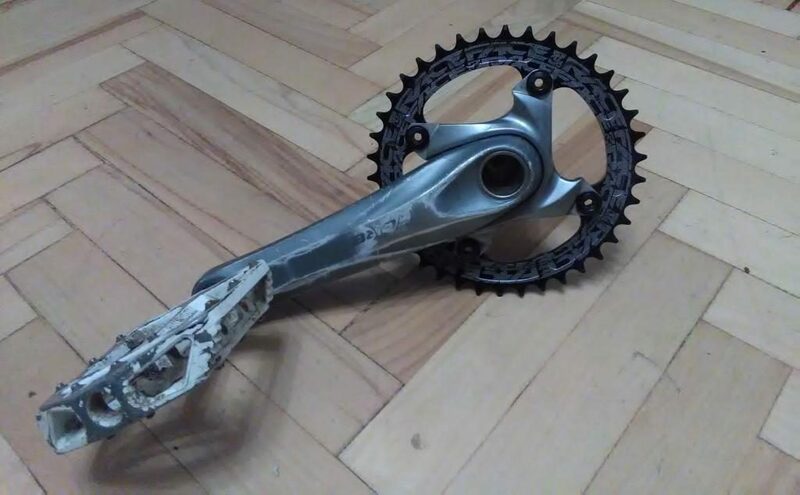 So when I learned that there is a definite trend to getting rid of front derailleurs on mountain bikes and substituting them with as single front chainring, I was happy. 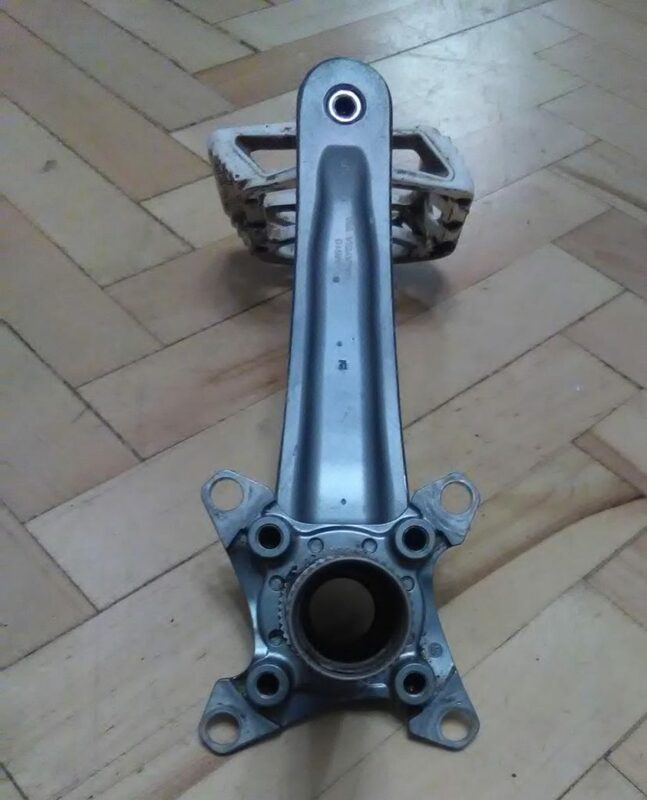 Surely, a wide cassette is a price to pay for reduction of gear ratio offered by the front triple. What I have on my GT is not very wide, but there are still ten cogs. I looked through the Net sources, learned of a possibility to go from a 3x10 system to 1x10, and decided to give it a try on my existing setup. Several photos of the conversion process follow. 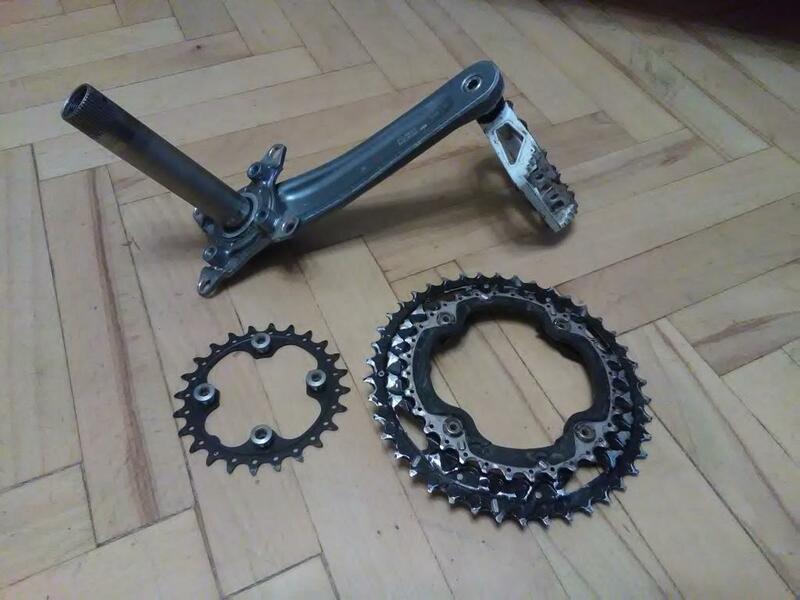 Shimano Deore crank with all three chainrings removed. I was too lazy to unmount the pedal; it was not in the way anyway. The smallest 24-teeth star was attached to the spider with its own four bolts. The middle 32-teeth and the big 42-teeth ones were connected together through four 104mm BCD holes in the spider with bolts. One more view of the spider. All eight holes for the bolts are visible. 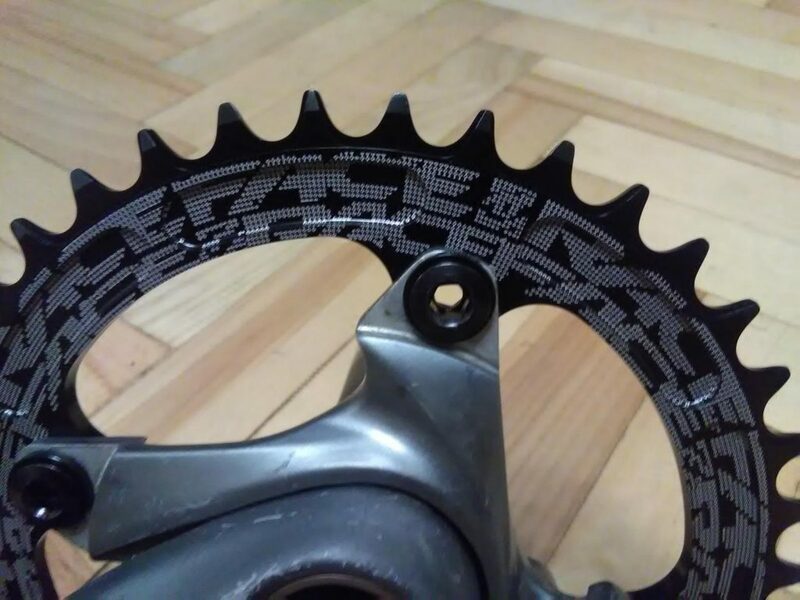 The new chainring is a 38 teeth one from Raceface. Below its rear side is shown. The ring turned out not to be completely symmetrical in regard to the bolt holes. 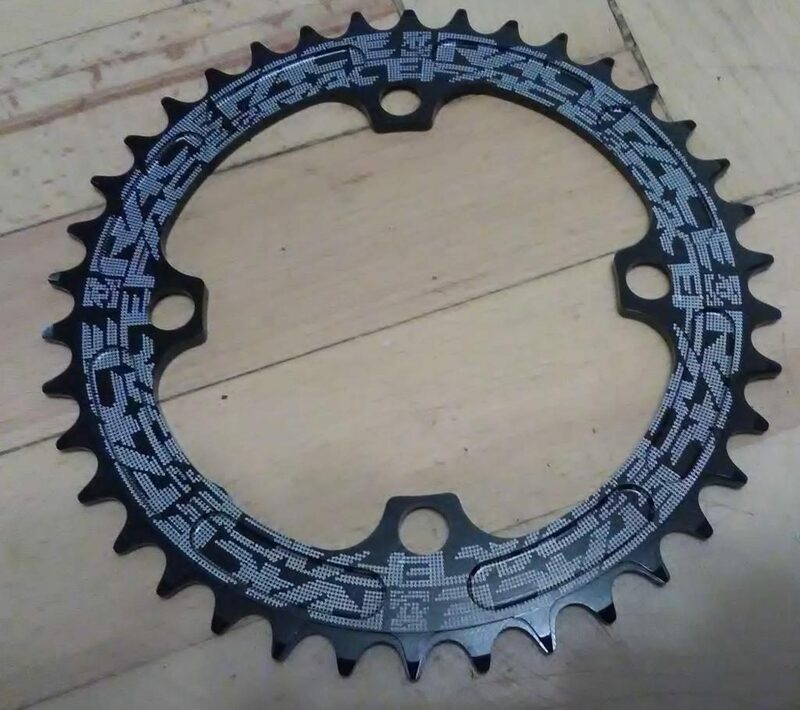 The front view on the chainring. Too much of visual branding noise to my taste. The chainring attached to the spider. A special set of bolts of different length were required, as well as spaces that came with it. This is because now these bolts are to hold a single ring, not a pair. 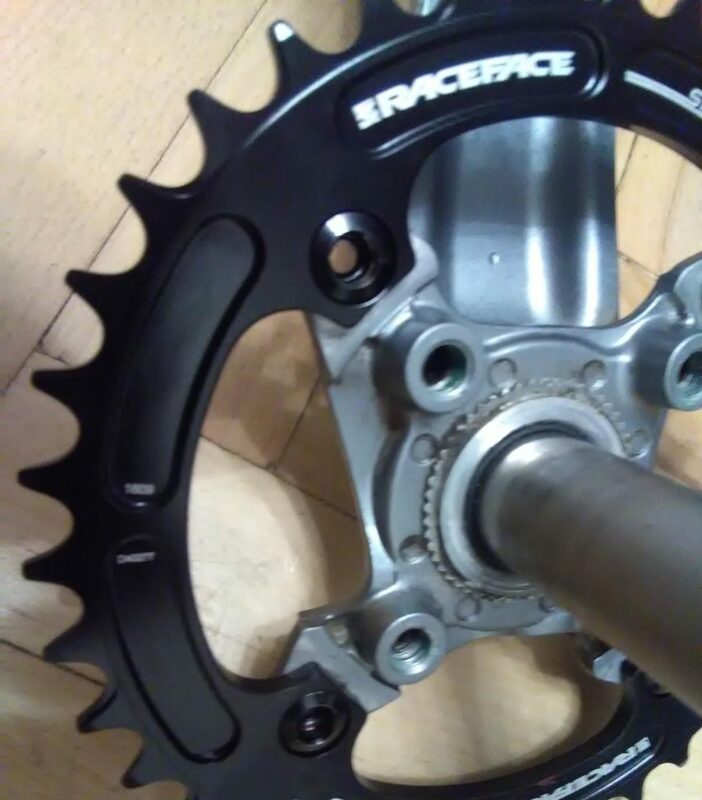 If I have had used a bash guard in place of the biggest ring, the spacers would not have been required. A close-up view on the bolts. The rear part is kept by 6 mm Allen key, and the front side is tightened with a 5mm key. The new chainring installed on the bike. 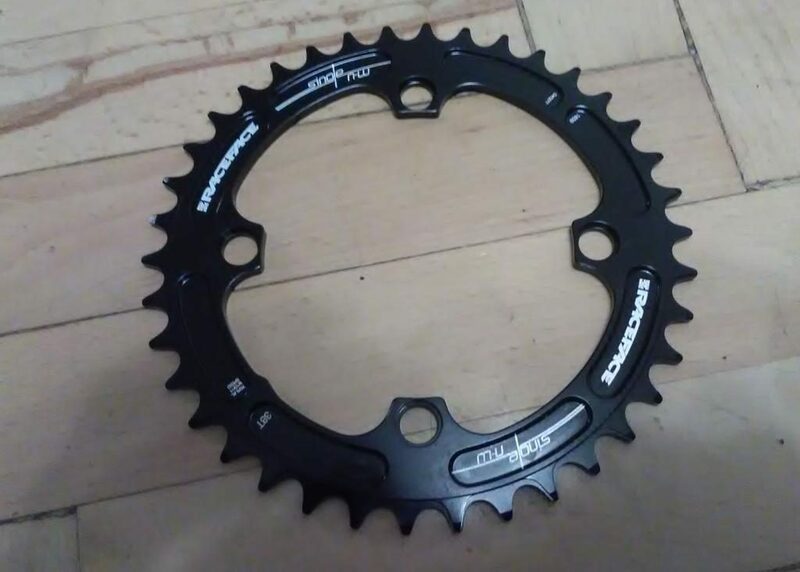 I have to note that I shortened my chain by four links: the previous biggest ring had 42 teeth, and the new one has 38, that is four teeth less. One last close up on the new ring. Unfortunately, I still have not got a chance to ride the new setup as I am still recovering from crash.